Aviation, in many aspects, has been a passion of Mary Ellen's since she started skydiving at Purdue University in 1983. While "Tandem Skydiving" is now mainstream, back then, it was a different story. Round parachutes that landed you like a rock, soloing the first jump with a "static line" attached to the plane to deploy the chute, and belly-mount reserves. Since those early days, she has logged nearly 6,000 skydives. Teamwork and camaraderie is essential in skydiving, since building freefall formations demands unparalleled reliance on others. It is this camaraderie, as well as the exhilaration of flying your body much like gymnastics, that keeps her captivated by the sport after so many years. Weber is a current member of the widely-known competitive skydiving team, Deguello, which competes in the 16-person (or "16-way") event. Deguello has been in existence for 30 years, longer than any other civilian skydiving team in history, and Weber has been part of it from the start. They have been a formidable contender at the U.S. National Skydiving Championships throughout this time, medaling every year through 2016 and overshadowing all other amateur teams from around the country throughout that time. They have been the only non-professional 16-person team to successfully beat professional teams including the Army Golden Knights, winning bronze and silver medals and even gold once. Deguello has been featured in premier skydiving magazines, such as Skydiving and Parachutist, on many occasions. ​Weber has also competed in and medaled in other events at the National Championships, including 10-way and 8-way. 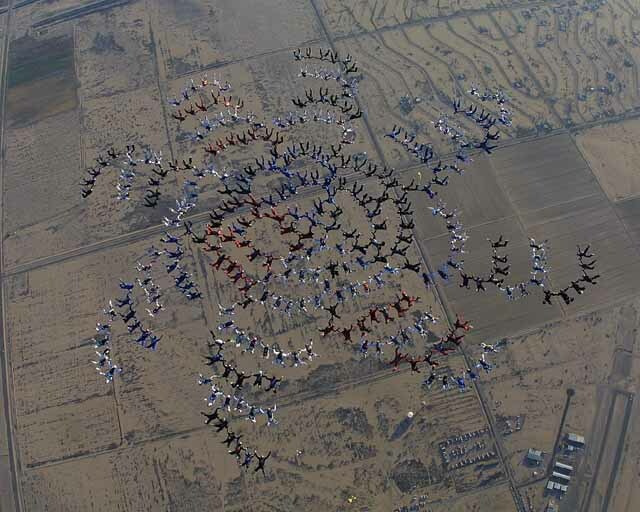 In 2002, she was in a world-record 300-person formation.